Reposted with kind permission of Marion Elizabeth Diamond from Historians are Past Caring. © Marion Elizabeth Diamond and Historians are Past Caring, 2012. I bought two kilograms of potatoes last weekend. Four days later, I took out the bag to peel some for dinner, and found that every single potato in the bag had shoots on it. I spent a minute or so muttering about supermarkets and their appalling buying policies, but then I realized that, in a funny way, I felt quite happy for those potatoes. It’s cold at the moment (by Brisbane standards), but we passed the shortest day three weeks ago. In their plastic bag, deep in the darkness of my pantry, those potatoes knew that spring is only a week or so away. We ask a lot of potatoes. There are some basic foodstuffs we expect to be on hand all year – potatoes and onions, apples and bananas, eggs and milk – yet even the humble spud is really a seasonal vegetable. Potatoes, © iamrenny via Flickr. In 1949 the pioneer in World History, William H McNeill published an article on “The Introduction of the Potato into Ireland” in the Journal of Modern History, based on his postgraduate work. Now that every commodity, from cod to coffee to the colour mauve, seems to have its own historian, it’s easy to miss just how innovative McNeill’s thematic approach then was. Exactly 50 years later, he returned to the topic with “How the Potato Changed the World’s History”, in Social Research: An International Quarterly (1999). His preoccupation is understandable, for potatoes really did transform the world. 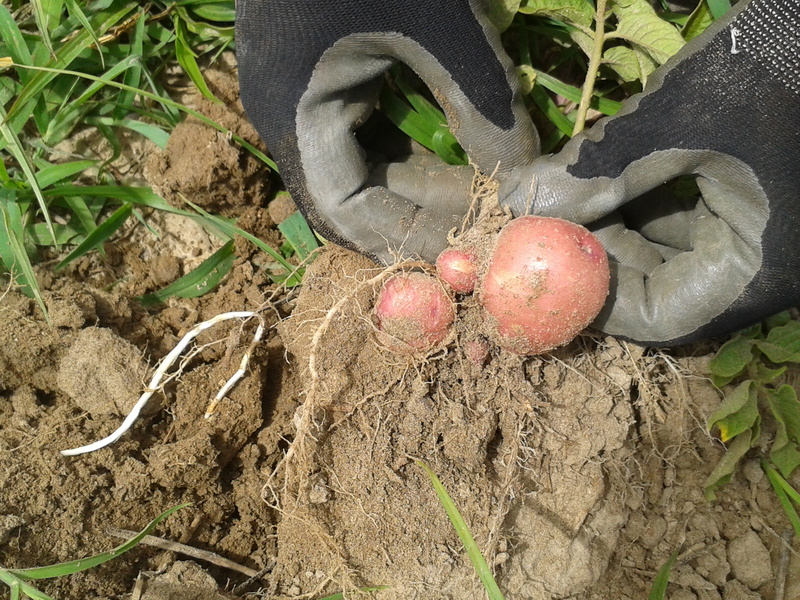 Farmers in the Andes first domesticated potatoes many thousands of years ago. From the wild potato, Peruvian farmers gradually line bred a tuber that was nutritious and so productive that it fed the Inca Empire. Potatoes belong to the Solanaceae family, which also includes deadly nightshade and other poisonous plants. Wild potatoes needed to be processed to make them safe, and even on modern potatoes, any green patches and sprouts can be poisonous. When the Spanish arrived, they took potatoes back to Europe, along with many other products of New World agriculture – tomatoes, chillies, tobacco, corn – as part of the great Columbian exchange that transformed both sides of the Atlantic. Until then in Europe, the main source of carbohydrates in the diet was wheat. This was a broad acre crop, sown by men guiding ploughs that were drawn by horses or oxen. But in South America, there was no comparable broad acre crop, because there were no draft animals (the llama is a pack animal), and therefore no ploughs. Peruvian cultivation was garden based, and the gardeners were usually women. They planted the tubers in trenches, gradually heaping on extra soil as they grew, to produce a high yield from small plots of land. Unlike grain crops, potatoes can’t easily be stored. In the thin cold atmosphere of the Andes, Peruvian farmers process fresh potatoes by leaving them outside to freeze-dry for several nights. This makes chuño, a dried potato that can be further processed into flour for long term storage. This wasn’t possible in the clammy lands of northern Europe, so potatoes were useless for long term storage. And that was an advantage. No tax collector or landlord wanted to fill their granary with potatoes, so peasants grew wheat to pay the bills, and potatoes for their own use, outside the money economy. Digging potatoes, © faul via Flickr. Potatoes store best when they are left in the ground after the plant dies down. In Ireland, the rule was: put the pot on the fire first, and only then dig up enough tatties for dinner. That was another advantage, in strife-torn areas such as Cromwell’s Ireland or Germany during the Thirty Years War. Rampaging armies might steal the grain harvest, or next year’s precious seed corn – but unless they had the time, and knew where to dig, they left the potatoes in the ground. When potato blight hit in the 1840s, this inability to store potatoes from one year to the next was a disaster instead. There was no fallback, no warehouses holding last year’s crop of potatoes that could be released. And people starved across much of northern Europe. We still ask a lot of potatoes, and when they fail us, they get the blame! Yet Ireland continued to export wheat throughout the famine years. Wheat was the market crop, the crop that paid the bills. Potatoes were a part of the non-market economy. Nobody knew how many potatoes were grown or eaten, and when the crop failed, it took time for awareness to filter through to the political class – who of course ate bread. Today there are other foodstuffs that rarely reach the marketplace, yet feed millions of people. 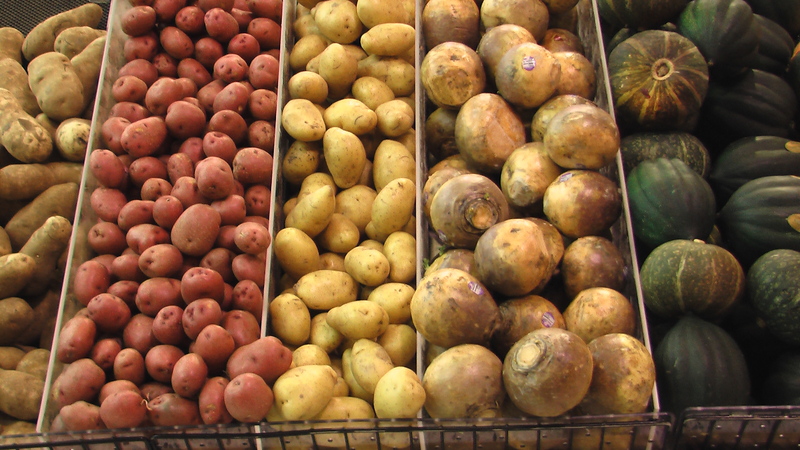 Bananas, taro, cassava all share some of the characteristics of potatoes. They are starchy and filling, but not very nutritious, and are often grown as a monocultural crop. They reproduce asexually, so they have very little genetic diversity. And they don’t store well. With more and more hot, dry summers, American food crops are struggling. Prices of grains will rise in the market place. But what will be the knock-on effect for foods like these, that don’t reach the market? Watch this space.